My main role as an in-house graphic designer at LHA was to create catalogues, which varied drastically between departments. You'll see them here, in addition to several advertisements for local and national trade publications in order to promote upcoming auctions. A 200-page laminated catalogue that had a circulation of about 10,000. 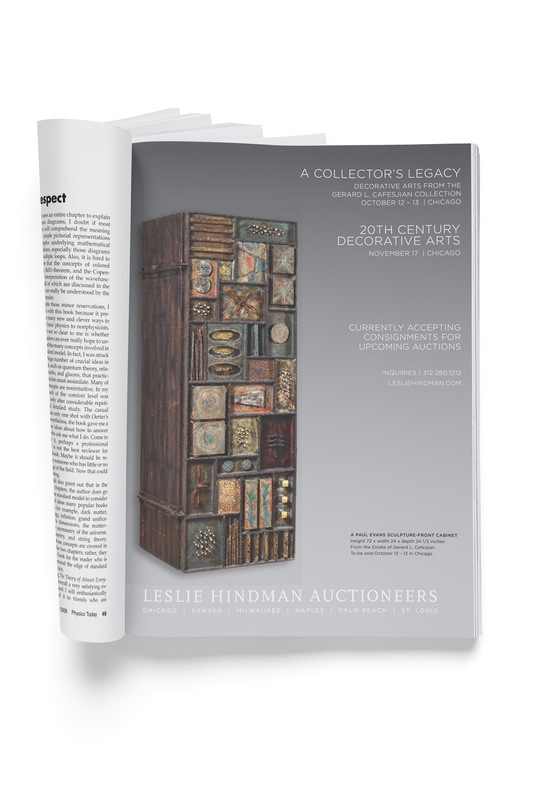 During my time at Leslie Hindman Auctioneers, I created upwards of fifty catalogues. Previously titled 20th Century Decorative Arts, this chic and trend-forward department stressed clean design and minimalist precision in strategizing the product's attraction to bidders. LHA's Couture department loved working with me because of my unabashed admiration for all their beautiful clothes. I created several of these pocket catalogues and interacted with names such as Louis Vuitton, Lanvin, and Prada with such delight. This is a large full-page ad that was featured in Antiques and the Arts Weekly. Here is a full-page ad that was placed in Fine Books and Collections Magazine in support of our Fine Books and Manuscripts auction. You'll notice the branding is dated on this piece. I was present and instrumental in LHA's brand overhaul process during the summer of 2016. This was an ad in support of the aforementioned Modern Design auction.